Summer has come to an end and a new TV season is revving up, which means second-run episodes of The Biggest Loser and Are You Smarter Than A Fifth Grader? will be replaced by first-run episodes of The Biggest Loser and Are You Smarter Than A Fifth Grader?. With the fall TV season underway it’s hard not to get a sense of déjà vu with shows like Melrose Place, 90210 and Eastwick filling out the primetime schedule. Regardless of whether or not Eastwick is a hit, the trend of adapting movies for the small screen is hotter than ever.Shows in the works include Parenthood, based on the 1989 film starring Steve Martin, and St. Elmo’s Fire, based on the 1985 brat pack “classic”. With an eye to the future, here are three shows based on movies from the 1990-91 season (I guess that was a big year for that) that didn’t make the grade. And, interestingly, they were all developed for NBC. I guess the currently last place network is no stranger to feeling the burn of failure. 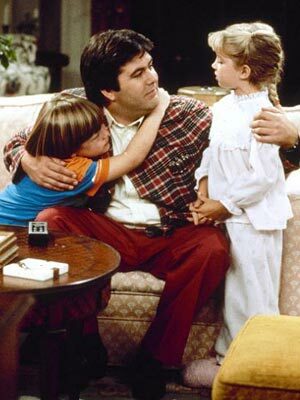 Stand-up comic Kevin Meaney took over John Candy‘s role in this short-lived series based on the hit John Hughes movie, Uncle Buck. According to IMDb, the show was successful when it debuted on Monday nights on NBC in the Fall of 1990, but suffered low ratings when it was switched to Friday nights. It was canceled soon after that. Since his brief stint as a sitcom star, Meany has continued to do stand-up and is currently touring comedy clubs across the country. An NBC promo for the show can be found here. In 1988, 20th Century Fox scored a huge hit with Working Girl, a film directed by Mike Nichols and written by Kevin Wade. It became a cultural phenomenon, making a star out of Melanie Griffith and spawning a hit soundtrack album. Carly Simon‘s “Let the River Run” even won on Oscar. The plot centers on Tess McGill (Griffith), a woman who works her way up to the top in the male-dominated business of stock trading. It’s all about female empowerment. Naturally, the idea lends itself to a TV show. So in 1989, Tom Patchett and Kimberly Hill developed Working Girl as a sitcom. They tried desperately to emulate the movie version by using “Let the River Run” as the show’s theme song (clip here) and by casting a fresh-faced unknown as Tess (Sandra Bullock, long before she drove a bus in Speed). But, for some reason, the magic was gone. Working Girl premiered on NBC on April 16, 1990. Viewers weren’ttaken by it. Twelve episodes later, it was canceled. Poor Sandy Bullock! I don’t think she ever quite recovered from this blow. As evidenced by the examples above, 1990 wasn’t exactly a banner year for turning out hit shows based on hit movies. Ferris Bueller was no exception. The movie version, Ferris Bueller’s Day Off, written and directed by John Hughes (just like Uncle Buck), was a monumental box office success, earning over $70 million on a budget of $6 million, and it was a critical darling. By 1990, when John Masius developed the sitcom for NBC, the character of Ferris Bueller had already become a cultural icon, largely due to the mainstream appeal of Matthew Broderick. Masius realized early on that he couldn’t beat the movie, so he decided to make the show stand on its own. Ferris (Charlie Schlatter) was made younger and the setting changed from Chicago to L.A. Oh, and Masius took out the heart and soul, only keeping the lame whimsy. is indeed white-bread perfect for the kind of fellow who finds the very concept of school totally bizarre”. Finally, there were all those teen shows assuring young audiences that teachers are dopey and education is a drag. Mercifully, two of the worst — Ferris Bueller and Hull High — have been canceled”. Today, much like Working Girl, this short-lived obscurity is most notable for featuring a soon-to-be famous actress: Jennifer Aniston who pays Ferris’ sister, Jeannie Bueller. She needn’t have worried too much upon its cancellation because it would only be three short years until Leprechaun, the film that first showcased the enormity of Aniston’s talents.